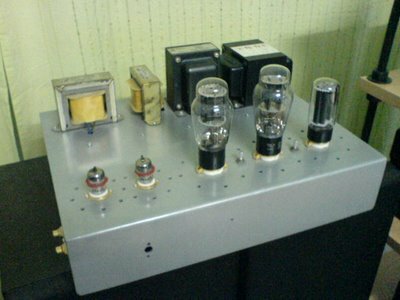 Here is the tube amplifier gallery of the DIY audio projects that I built in the past. 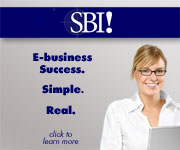 It is such a waste that I did not have pictures of the older projects as digital camera was not that popular back then. Please forgive me for the low resolution pictures as it was taken with my 2MP cellphone. It uses 5687 mu-stage / u-stage RC coupled to 300B with 5R4GB rectifier power amplifier. Power transformer is from P* Audio. Choke and output transformers are from Hammond. 5687 is Tung-Sol, 300B is from JJ, and 5R4GB is from RCA or GE. It is very similar to Carmen except the components quality is better. It has been in service for almost 3 years and the tubes are still going strong. I run the tubes at about 80% of maximum dissipation. 300B heaters run on regulated DC. I tried AC on the 300B heaters but the bass is not to my likings. This guy gives ~8W of SET power. I’ve tried it with 88dB/w/m speakers and it didn’t break a sweat. Best match would go to speakers with 92dB/w/m and above so that it will sound more relaxed and controlled. This is the longest serving gear I have in my physical tube amplifier gallery. Kudos to 300B tube! 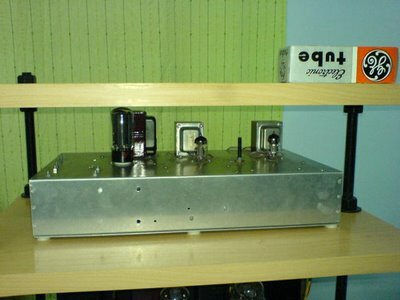 This is a single tube single stage ultra minimalist integrated amplifier. Power tubes are from Sovtek and Reflektor. Rectifier uses 5U4GB from RCA. Power transformer is locally made by Tonsin. Chokes are from Hammond and output transformers are from Sowter, UK. The chassis is from Hammond and is really easy to work with. It is as strong compared with the custom made chassis but for experimentation platform, it is very useful. I would strongly recommend this to all if the project is not that complicated and heavy. Due to the minimalist design, one can really splash on it due to the low component count and low voltage requirement. If you’ve speakers efficient enough, this will be the ultimate amplifier you can build. It gives out about 1500mW of power with 6C45 run to the maximum dissipation, or over the maximum for my version. We can replace this with 5842 or JAN5842 / 5842WA as well. Power will be lower but there are more variants to this tube since one could get RCA, Western Electric, Raytheon, Amperex and such branded tubes. Power will be lesser (around ~0.7W to 1W). This guy is out of service now since I took out the output transformer (OPT) for my 6B4G SET project. It shall have a heart surgery soon to install a new pair of OPT and reinstate his status in my "working" tube amplifier gallery. It uses RCA 5842 RC coupled to RCA 6B4G tube. 6B4G is a dual-plate version of 2A3 with a 6.3V filament. It is poor man’s 2A3. One can still get NOS (New Old Stock) 6B4G at a decent price. To my ‘wooden’ ears, NOS 6B4G sounded the same as reissue 2A3, if not better. There are 2 reasons audiophiles do not like it. Firstly, the filament is 6.3Vac that is prone to hum if it is AC heated. Secondly, all 6B4Gs are dual plate and that is against the minimalist spirit. There are still plenty of NOS around the vendors. Rectifier is RCA 5U4GB. Power transformer is from Tonsin. Choke and output transformer is from Hammond. The highs and lows are attenuated due to the limitation of the low end model of Hammond output transformer but it is one sweet and warm sounding amplifier. It gives out about 3W. This guy is still in the physical tube amplifier gallery but shall be dismantled and convert to 801A prototype amplifier experimenting and tweaking soon. #45 is a very famous tube! It is one of my favorites as well. Although the output power is low, the sound is larger than what the specifications say. 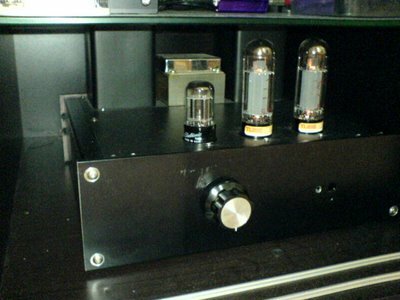 This amplifier uses RCA 5842 triode RC IT (interstage) coupled to the Tung-Sol #45 tube. #45 is a low power direct heated triode. Rectifier is 5X4G. I’ve an opening for me to switch to Telefunken AZ12/AZ11 in the future. All the power, interstage and output transformers are from P* Audio. Chokes are from Hammond. Chassis is from the master chassis builder, Adrian Chin. It is not as sweet as the 2A3 but the balance is better. Due to the lower power nature (1.5W), matching is very important to fully squeeze the performance out of this amplifier. I’m current not that happy with this amplifier. Hope that I’ve time to revisit it and get it tuned properly. 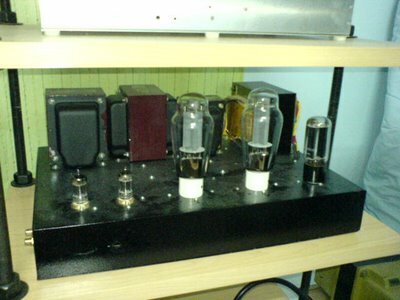 It is in my physical tube amplifier gallery but not in service. This amplifier is actually designed for 12SN7. 6SN7 can be used here too by just a flip of wires. 12SN7 is a 6SN7 with a 12.6V filament voltage. I used 12SX7 in this version. 12SX7 is a military version of 12SN7. 12.6V variant is used to avoid spending too much on the sought after 6SN7 tubes. Rectifier used is 5Y3GT from Brimar. Transformers are a mix of locally supplied ones and those from Hammond. There are two 9-pin sockets for upgrade or modifications later. I might add a cathode follower at this space in the future to drive long cables for the subwoofers. I love this chassis too. It is made of a combination of aluminum and Bakelite panels. It is very sturdy and vibration resistant. This guy is still in service at my physical Tube Amplifier Gallery! 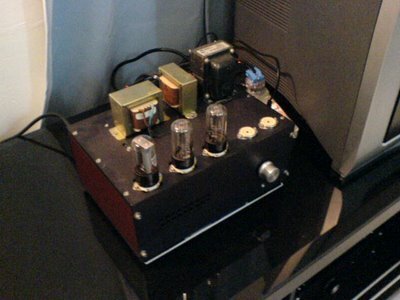 This is a simple single ended class A EL34 tube amplifier. 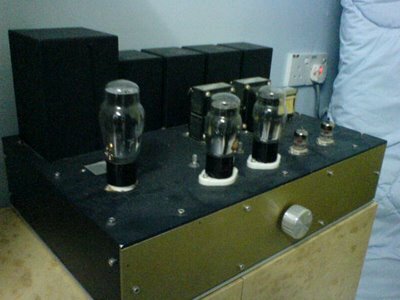 It uses 6SL7GT twin triode as driver tube to RC coupled to EL34 pentode to form a 2-stage tube amplifier. Rectification is using silicon diodes. Output transformer is from James. Choke and power transformer are from a local vendor. It is as simple as it could be (exception if compared to 6C45 SPUD) yet it sounds surprisingly good. There are currently a lot of inexpensive reissues of 6SLGT and EL34 for users to choose. So, it should be a fun project and a great platform for users that like tube rolling. Output power is about 5W. One can convert this to Pentode mode to gain more power. Ok, that's the end of this Tube Amplifier Gallery page. Stay tuned for more projects in the future!